A compass is an instrument that shows directions. We use a compass to find our way in uncharted territory. Similarly, we need an Islamic compass to find directions in our journey through life. This compass points the right directions. Sirathal Musthaqeem. Taqwa, developing God-consciousness, is the Islamic compass for us. It is a strong belief that we are being watched constantly, all the twenty-four hours of the day and we are responsible and accountable for all our actions. It is a secret life between self and God. Islam prescribes a complete code for life. It lays down the universal principles. It is a way of life that fits into the Natural Law with a definite code of conduct in all areas of human activities. It is concerned with internal and external aspects of life. Internal aspects of personal life are concerned with prayer, fasting. charity, God consciousness, truth, love, compassion to humanity, sacrifice, self-discipline, self-control etc. Family is an important social institution. The Islamic code lays down detailed guidelines in all matters concerning the family life. It aims to bring harmony in family relations of marriage, the rights and responsibilities of husband and wife, parents and children, etc. The Islamic code relating to social and economic life aims to achieve justice and prosperity for all. Everyone is equal, irrespective of race or colour, social origin. nationality or wealth. Earning one's living through decent labour is worship in Islam. The rules regarding inheritance of property. interest free finance, taxation etc are quite specific. The Islamic economic system aims in the welfare of the people. The Ultimate Sovereignty belongs to Allah. It ensures protection to Non-Muslims. The governing principle of the Islamic State is the concept of Trusteeship of God with great responsibility. The Islamic system aims to bring harmony and cooperation in international relations. It is based on the concept of universal brotherhood. Islamic compass brings alignment in all spheres of life. If you do not hold the rope of Allah in all activities of life such as family, social, economics etc, it will not be aligned and may be lost in isolation. 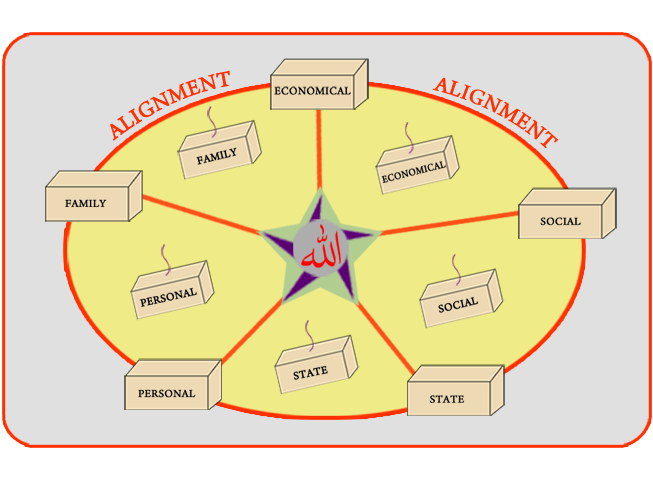 If you hold the rope of Allah firmly you will find a strong alignment as seen in diagram and your life will be smooth like a well-lubricated engine. The rope of Allah drags and guides us along the right direction in all our activities of life. The Sixth Principle is to keep an Islamic compass always within you in all areas and activities of life.